Throwback Thursday takes us back to the first week of August in 2011. That weekend, like the other first weekends in August for the last 15 years, my DH rode in the Pan Mass Challenge, a 192-mile, two day ride from the western (ish) part of Massachusetts to the end of the Cape (Bourne) and then all of the way up the Cape to Provincetown to raise money for cancer research. He first rode on a team with the Dana-Farber Cancer Institute when his best friend was a doc doing his fellowship there. His friend is now in Cleveland, but my DH has continued riding all of these years with a Farber team. In the days before our daughter arrived, my role was to provide drop-off transportation in Boston at Dana-Farber on Friday and pick-up transportation in P-town on Sunday (which I did not do graciously because there’s little I hate more than sitting in Cape traffic). Over time, a dear friend of ours starting volunteering as a mechanic for the ride and his dear sister who has a house on the Cape gave us a place to stay so we made a weekend of it. The girls would hang out on the Cape, spend Saturday at a nice day spa and wait for the boys to arrive on Sunday. The spa days are over for a while until my daughter’s old enough to enjoy them, but we’ll be heading down on Sunday this year again to do pick up. So, this quilt doesn’t really feel like much of a throwback after all. 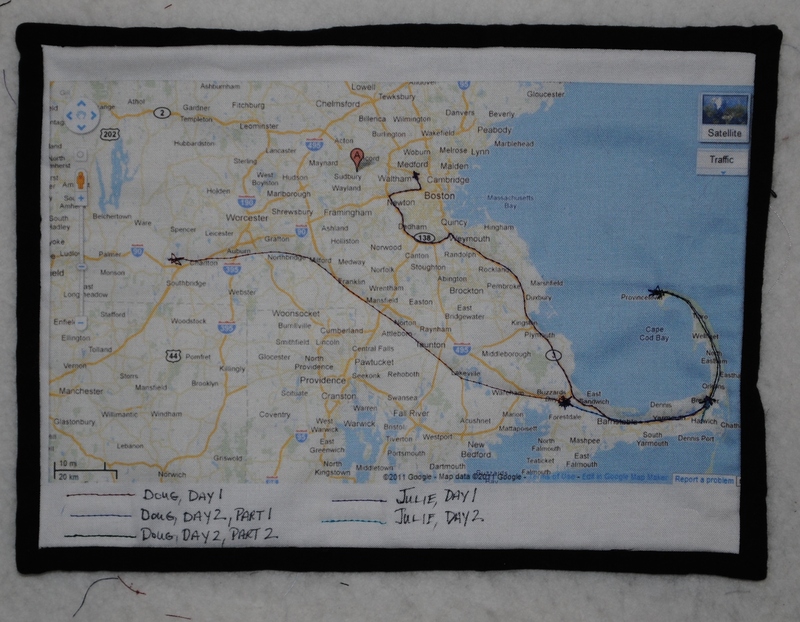 The quilt is very simply a map printed off onto fabric with the route added in thread. The blue line on Day 2 for me represents the drive to the spa. Part 2 of Day 2 for my DH is the extra 30 miles he rides back to the house from P-town just to spare himself my complaining about Cape traffic.